Beginning Friday, May 17th I will be making daily entries about my trip to Tennessee. Please come back then to travel along with me. This trip is supported in part by a Professional Development Grant from United Arts of Central Florida. 5-9-2013: While the trip is just over a week away, I thought that I might jump the gun and tell a bit about what I am doing to get ready. For the past year I have been reading books about the areas that I will be traveling. Some of these books may seem to be a little off the subject, but they all have given me some perspective. For example, I read Mark Twain’s Life on the Mississippi and learned a good deal about the culture of the 19th century that flourished on and about the Mississippi River. I have also gotten a good deal of information from the WPA Writer’s Guide to Tennessee, which was written in the 1930s. Also I have been searching the web for information about the small towns in the areas I will visit. This research will give me a little background about the places that I will visit. There has also been some thought given to the details about the actual trip. For example, I have been searching for suitable hotels, figuring a budget, and studying my maps to plan the roads that I may want to travel. Consideration is given to the more mundane details such as how much cloths to bring and making sure that I will have everything that I need photographically speaking. It is getting close and there is a lot still a lot to do, but I am moving forward so that early on the morning of the 17th I will be on the road. 5-17-2013, 8:34pm: It was a long day of sitting in my van watching the miles go by. I have to say that considering that the first day was to just get up to Memphis, it was very enjoyable. Two-Thirds of the trip was made on I-75 and I-20, but once I got into Alabama I got to see a little more of the country. I had forgotten how rolling the northern part of Alabama is. After about 13 hours of driving I arrived at the motel in Memphis, and I was surprised how fresh I felt. I took only one picture today, which was pretty good since I did not think that I would make any, but outside of Birmingham, I got off the interstate and saw something that I knew I had to stop. It rained most of the way through Alabama, but I think the wetness give the landscape an interesting light quality. The sign itself is very small, and driving by I was not sure what it said, but I could see that it was handmade, so I decided to turn around and take a closer look. The road was busy, but I liked the natural landscape aspect of the scene, so I did not include the road in any of my compositions. Given the religious nature of the message of the sign, it seemed only right to include a natural landscape. My project is centered on showing something of the history and culture of the areas that I photograph, and I think that this sign fits that theme very well. Now that I am in the room, I will take some time to write in the blog, process a representative image or two and organize the room. I am going to hit the rack early, as my energy level is catching up with me. Since I am not in a different time zone, I am sure that I will get up early tomorrow and then I will give some thought to the day’s photography. I think that I should be heading across the Mississippi to Arkansas. I hope to see some things in West Memphis, and then head up Highway 61, poking around here and there. I also plan to go to Dyess, Arkansas, the location of a New Deal, Depression era community that I want to take a look at. Time permitting, I will go by Sun Records on the way back to the motel at the end of the day. 5-18-2013, 4:30am: Some of you may be wondering why I am getting up so early. The reason is the time zones. My body clock is still on Winter Park time and so while the clock says 4:30, to my body it is 5:30 and about the time I would have gotten up at home. I had a good night’s sleep, the room is most comfortable and quiet. I think that this will be a good place to use as my base for the next several days. When I have been talking about this trip I have always mentioned it in terms of going to Memphis, but the reality is that Memphis is more of a central location to all the other places I want to see. I will spend some time in Memphis, of course, but like today, I will be poking around other areas that would be a days drive from here. Today, I am going to cross the Mississippi to Arkansas and one of the main stops will be Dyess, Arkansas. Dyess is mostly likely best known as Johnny Cash’s home town, but that is not really the reason that I want to go there. The Dyess Colony began as a Roosevelt, New Deal program when the Federal Emergency Relief Administration, (FERA) hired William Dyess to administer a series of farms that would go to tenet farmers. It struck me as somewhat odd that William Dyess was the one who owned the land and sold it to the government. They recruited the famers to take over this land, and in turn their plot would be sold to them with the easiest of terms, paying when the crops came in. In exchange for building the infrastructure of the town and helping all the famers clear out the swamp and make it farmable, the selected farmers would get their land. Several families were selected, but even more were turned down. Roy Cash was one that was turned down, but when another family could not make it, he was chosen to fill in. So, in 1935 when Johnny was about three, the Cash family moved to the brand new, though undeveloped colony of Dyess. How the families were selected was interesting to me, and somewhat telling of the times. All the families were white. From what I read in a Cash biography, there was one black family that lived near there and was hired to help with the land clearing, but only whites were given plots to make their own. All the participants were Protestant. There were some rules established that today would not be very politically correct. The colony did well, a town center was built with a city hall, community theatre, and a school. However, trouble did come one year from a flood, which became the subject of one of Johnny Cash’s early hits. Roy Cash did well, and after time expanded his holdings, but it was difficult at first. From what I understand, there is not a whole lot left of Dyess, as after the war many of those of Johnny’s age left the farms for better paying industrial jobs up north. While I am not sure how much I will find, (I know some of whats there from Google Earth) I am interested to see what is there not only from its history, but also its legacy. I will have some images here and on my Flickr site this evening, so you all can see what I found. 5-18-2013: 2:39pm: As sometimes is the case, the sun has yet to come out today. This morning there was a heavy overcast that really killed the light. But then, I aways have thought that there is no kind of light that is not good light for some kind of photograph. I tested that belief today. I saw a good deal of things that I wanted to photograph, however the light never seemed to be right. Still, I made some photos that maybe will not be the best of the trip, but will convey something of what I wanted to capture. 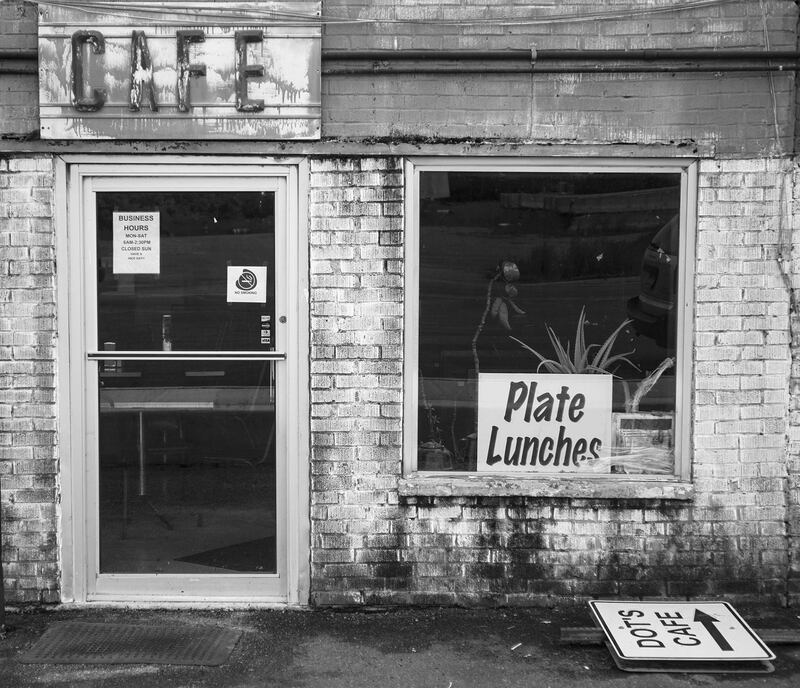 I was unsure about what I would find in Dyess, Arkansas, and there are really only two buildings left from its Depression era days. The Community Theatre is all but falling down. They are trying to restore it, but the back end of the building is basically gone. I am not sure if that was just part of the restoration process, or that it is just falling down. I am sure that it was not built to last back in 1935, so it is no surprise that it was in such bad shape. Looking around Dyess I was taken with the fact that the people there looked like they were doing OK. In a lot of what I read about Dyess, it seemed that the post war exodus of most of the kids of Johnny Cash’s age left, with no yearning to come back. The ground was black, enriched by the alluvial movements of the near by river and the fact that it was carved out of a swamp. After the rain of the past couple of days, the land was soaked, but still good dirt for planting. Maybe those who remained did not need those who left as I saw a good number of large large yield field equipment. There was also a series of fairly large silos to store what the farmers grew until it goes to market. 5-18-2013, 6:36pm: After leaving Dyess spent some time in West Memphis and then on the way back to the motel room I stopped by Sun Records in Memphis. 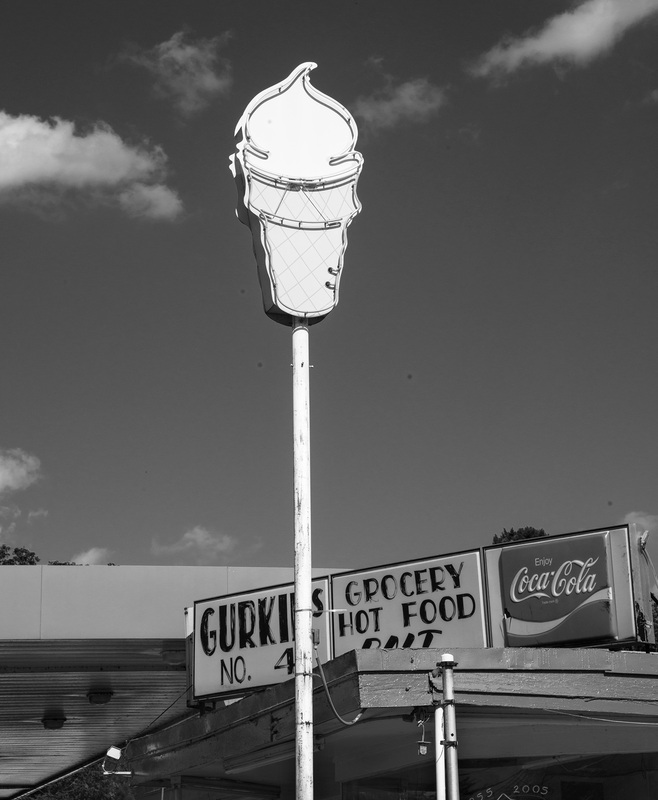 (see photos of the afternoon on my Flickr location) More and more I am thinking about the Memphis area’s music legacy. It was in West Memphis where such blues greats as BB King, Muddy Waters, and Hollowing Wolf got their starts. 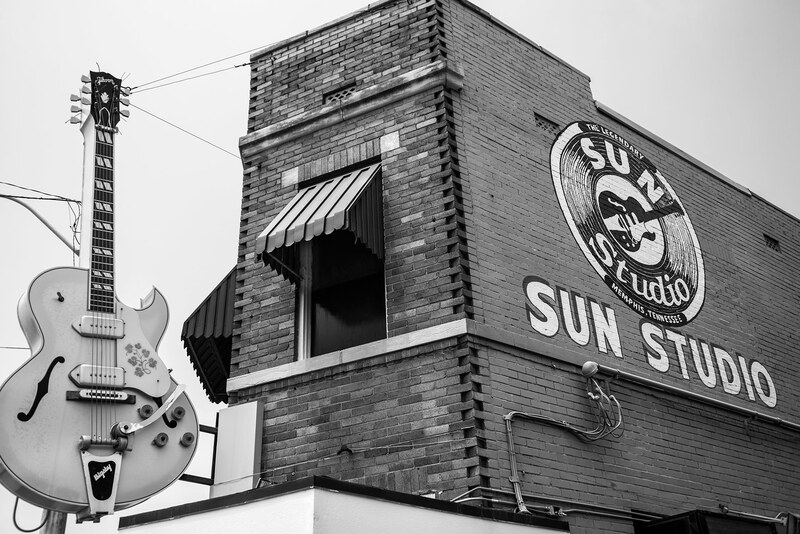 Sam Philips at Sun Records was among the first to record some of the legends of the blues in addition to Ike Turner, better known as Tina Turner’s husband. Ike, who was the lead member of a band called Kings of Rhythm was said to record the first Rock and Roll song. They got their unique sound when traveling from Clarksdale Mississippi to Sun Studios, one of their amps fell out of their car breaking a cone and causing it to have a fuzz. Phillips liked the sound and kept it on the record. Many of these artists later became well known blues artists got their start doing 15 minute radio shows at KWEM. Sam Philips made his fame with the recording of a Tupelo truck driver, Elvis Presley, guitar virtuoso; Carl Perkins, Johnny Cash, and “The Killer,” Jerry Lee Lewis. When his black stars moved to Chicago Philips sold their contracts to Chess Records and his white stars to the major recording companies like Columbia. Jim Crow and the promise of factory work and its higher wages made the most talented black performers figure their future was up north. Memphis was home to several innovated recording studios, and many well known artist came to Memphis specifically to record here. Stax was well known for its mixed race house band, including Wilson Picket, Donald Duck Dunn, Steve Cropper and Isaac Hayes. Ottis Redding also recorded at Stax. Lesser known, but preferred by those who knew was the American Studio. Music has a much deeper history than Beale Street. For example, the beginning of Memphis’ music legacy is actually from the German immigrants who came here in the 19th century. They establish a number of popular bands and many of the music stores and instrument manufacturing. There is not too much visual about this aspect of Memphis’ music history, but it has to be considered in its music scene. I am planing at least to spend at least part of the day in West Memphis to photograph some of the things that I saw today, but did not because of the overcast light. I have some places in Memphis proper that I want to explore, like some ribs at Silky O’Sullivan’s on Beale Street. All work and no play would make Rick a dull photographer! 5-19-2013, 4:11am: Again, I am up early, as I am still living on Winter Park time rather than Memphis time. I assume that I slept well, as I was asleep and was not aware of how restful my night was. My back hurts some, but I have no doubt that will get better when I stretch out a bit. Yesterday I felt that I left some good images behind, especially in West Memphis, so I am going to return there this morning. Checking my weather app on my phone I should encounter partly cloudy skies, but no rain. I doubt that I will have the amount of overcast that I experienced yesterday. I also hope to send some of the day in Memphis proper. Again traveling around town yesterday I saw things that I found interesting, but felt the light not to be good enough to make the photograph. Mainly due to weather I would rank yesterday’s photos as OK. I hope to do better today. For me Sundays are always a better day to photograph in town as there is usually less people milling around. Maybe it is me, but on the way to Sun Studios yesterday, I past by a park that had a very large equestrian statue of Robert E. Lee. What I found interesting was that the park is located on Union Street. During the Civil War, Memphis was mostly under control of the Union. General Grant used Memphis as his headquarters prior to his moving down to Vicksburg in the early spring of 1863. 5-19-2013, 10:36am: With the light being much better, I had a good morning shooting, mostly along Broadway Blvd. in West Memphis. I returned to a couple of places where I visited yesterday, but passed on because of the light. Most of the businesses that I photographed represent not only one’s income, but also their culture. This is true right down to the symbolism used to show off there business including type face. I am going to spend some time actually in Memphis. 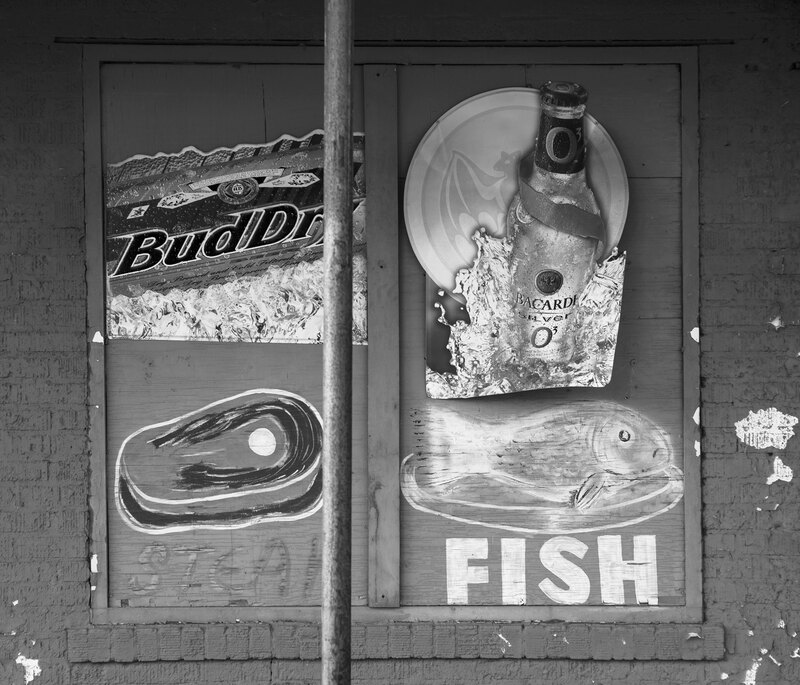 Unlike the places that I photographed yesterday and to a lesser extent, West Memphis, the city of Memphis is diverse enough that it will be my guess that culture will be expressed in a number of different ways. 5-19-2013, 3:49pm: As the day wore on, I kept feeling more and more under the weather, so came back to the hotel early. Nothing to worry about, just not feeling just right. Maybe one of the reason was the ribs that I had at Silky O’Sullivan’s on Beale Street. I had first heard about Silky O’Sullivan in the book, Highway 61 by William Keen. Silky took Keen under his ample wing and made sure that Keen and son had a good time and met a few people that were interesting. While it was never said, I got the feeling that Silky was fairly old back in 2000 when the book was written, so when I asked the waitress if Silky was there, she said that he did not come in all that often any more. My ribs were very good, but may have been a little too much for my digestive system, given that I have been on a diet of salads and lighter foods for the past year. Walking down Beale Street, I was overwhelmed by the infusion of music coming from the various venues, both inside and out. My only complaint, and maybe why I did not take more pictures there, was that there was a Disney like feel to the place, changing even from when I was last here in 2007. Beale historically was where the Memphis blacks could open a business and make his way to middle class status, or maybe even become wealthy. Over the years Beale Street had its ups and downs, with periods of economic good and bad times, along with various epidemics that would come through town. Sanitation was not always followed to any high degree, so especially in the summer, fevers would ravage the Black community in Memphis. Beale Street is now a tourist trap. More and more, large companies, like Planet Hollywood, are coming in and taking over the marketing of the blues from their creators. Across from Silky O’Sullivan is Handy Park, to honor the contributions of the one called the “Father of the Blues.” Within the park are a number of music venues where free concerts were beginning to start when I went by. I took a picture of the statue of Handy and a black gentlemen came to me and asked if I knew that Handy was the father of the Blues. I said that I did, mainly it is because what all the books say, and I was expected to say so. What Handy invented was a more ragtime music that was somewhat based on the Blues. The story goes that he was at the train station in Tutwiler Mississippi when he heard this old and tattered man playing the guitar using a knife as a slide. Handy uses this experience as the basis of his more orchestrated compositions such as the Memphis Blues and the St. Lewis Blues. If I was going to call anyone the father of the Blues, I might look to someone like Charley Patton, but given the music evolved rather than inventive I am not sure who the first Blues artist was. 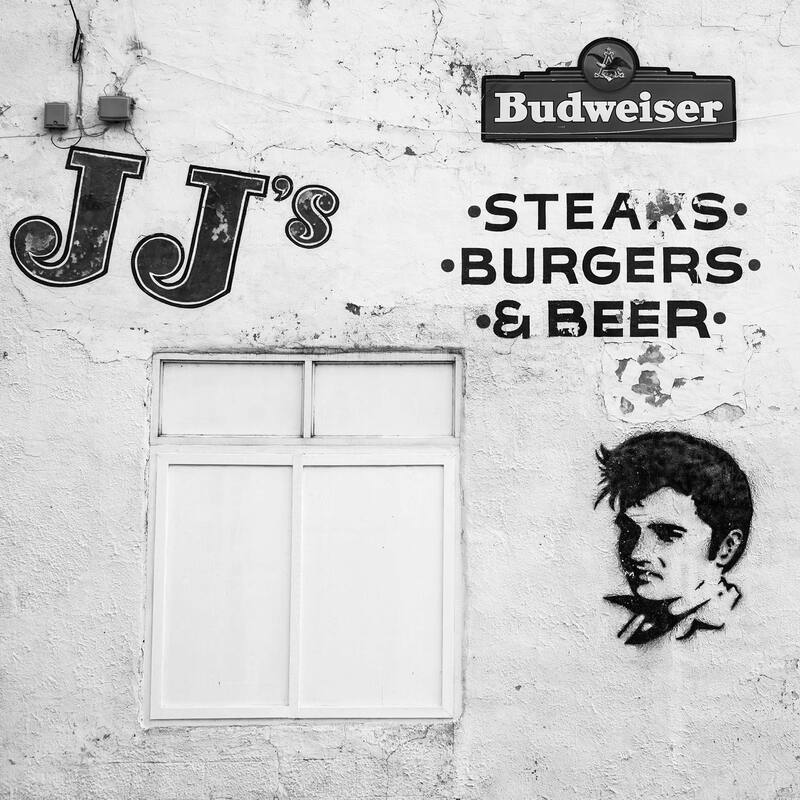 As I was driving away from Beale Street I saw a place called JJ’s and they had a picture of Elvis on the wall. I am glad that I took the picture when I did because when I passed again a couple of hours later they were scrapping the wall to repaint. Despite my uneasy stomach, it was not too bad a day of pictures. 5-20-2013, 4:43am: Today, the plan is to head north to small towns on the east side of the Mississippi. There will be more driving around, which is a little more the way that I like to work. A good part of the day will be moving along Highway 51. In the 1930s the WPA did a series of books of as many of the states that the project would allow. The plan was to do one for each state, but World War II came along and cut short the program. A part of all these books was a section called the auto tour, where they would select a route and then write a short description of each of the towns that would be along the given road. Unlike in the Florida WPA guide, Highway 51 has kept its name and will be easy to follow the directions given almost 80 years ago. This road roughly follows the Mississippi River to the east and was the heart of the heart of the cotton growing region of the state. Something that I will be looking for is that there are few, if any towns right on the river. I am guessing that the reason for this is the Mississippi’s tendency to flood, and the towns are located enough east as to not to be subjected to the yearly rise of the river. While there are many devastating aspects to the flooding of the Mississippi, it does restore the rich soil with the silt that it brings with the floods. This the reason the Mississippi basin is one of the most fertile lands anywhere in the country. To the south, between Memphis and New Orleans, there is a system of levies that allow towns to be set up closer to the river. Memphis and Vicksburg are located on high bluffs and are not prone to flooding and thus the main reason those cities were started there. I will be interested to see if there is a levee system built to hold back the water in this northern part of the state. One thing that I noticed yesterday and before, was the water was high on the river and there were places where there was a good deal of water that I would guess do not always have so much water other times of the year. One other thing that impressed me about the river, getting a little closer look at it yesterday and that was how fast the water was moving. The flatter land and the absents of hard rock have allowed the river to meander rather than cut a gorge as the Colorado did to make the Grand Canyon. Mark Twain wrote in his book, Life on the Mississippi, how the river was ever changing and that to navigate it safely from season to season, one much be most aware of the changes of the flow of the river. The trade off, and I think in the end a good one, was the deep black soil that was so important to growing crops. While that deep black soil also contributed to the extension of slavery, by creating the need for cheap labor, and set up the circumstances in part for the Civil War, it has also defined America as the bread basket of the world. One last note, I mentioned yesterday that I did not feel that well. When I came back to the hotel, about 6:00pm I crashed. My body likes to keep with its schedule. Between the time change, the different times that I would have meals and the different food I was having, it all caught up with me. I feel asleep about 6:30 or so and did not wake up until after midnight. I thought, “Damn, now I won’t be able to go back to sleep!” but that turned out not to be a problem. I feel much better this morning and maybe a little more in sync. Looking forward to today, a little more refreshed, but knowing I am beginning to feel my age. 5-20-2013: 8:00pm: Sometimes, you never know what you are going to get. This morning I was heading up highway 51 to what would be a more rural part of the state. Whenever I have a day of shooting like this, I never know what there might be. In the beginning I just did not see anything and I was getting a little worried. At times like this, I just stop to photograph anything that I feel might have at least some possibility of becoming a good image. Once I do that, it seems to open the flood gates and I start to see what the possibilities are. Today was no different, I did not see anything for about an hour, but then I made several stops throughout the day. The towns that I visited were typical of southern rural towns. Along the highway there was an assortment of “big box” stores and fast food, and then there would be a sign for the historical district, which was once the main downtown area. In these area most of the stores would be closed except for the businesses that supported the courthouse or City Hall. So there would be a mix of lawyer and bail bonds offices with maybe a small collection of antique store, which is a small town way of saying a junk place. There may be a small cafe, that would only serve breakfast and lunch and would be closed by 2:00pm. The highway that bypasses the downtown is busy with all the people buying what they once bought in town, but now are getting at Walmart. Forgive me if I sound a little bitter, but the big box stores and fast food places did not do the communities any favors. Really, the only thing that looked nice downtown was the well manicured landscape of the County Courthouse. Towards the end of the day I drove closer to the river and visited Ft. Pillow. When I travel, I try as much as I can to visit a Civil War battlefield. About 40 miles north of Memphis, it was Ft. Pillows’ duty to protect the northern access to Memphis. Ft. Pillow was named for Confederate General Gideon Pillow, who was a Mexican War Hero. The Civil War turned out not to be kind to General Pillow. After some victories against Grant early in the war, he was the commander of Ft. Donaldson, when he surrendered the fort to Grant. Then he and another general abandoned the fort and in the dead of night escaped, leaving his troops to deal with becoming prisoners. Only General Bedford Forrest stayed with his men, escaping via a desperate ride though the enemies lines. Pillow lost his commission because of his actions at Ft. Donaldson, and spent the rest of the war at his plantation. Ft. Pillow fell into the Union hands fairly early in the war, (not because of bad generalship by Pillow) when in 1864, the same Bedford Forrest retook the fort with about 2,000 men. Captured among the solders was a group of recruits that were being assembled with freed blacks and escaped slaves in the time after emancipation. While there are some disputes about this, Forrest was said to massacre about 600 Union solders, about 60 percent of who were black. The confederacy in the end would not parole black prisoners as they thought of the them not as solders, but as propriety. From that time on, Grant would not parole any more confederates and this led to the hard times prisoners had in both Confederate and Union POW camps. I spent a good bit of time thinking about the legacy of the Civil War in the down time I had between photographic stops. 5-21-2013, 3:48am: Today, I am going to head east. According to the weather reports the storms that have been so hard on the Mid-West will be making its way to Memphis sometime today. Heading east will give me a chance of having better weather a little bit longer. Keeping with the Civil War Theme of yesterday, I will travel to the Shiloh Battle Field, the location of one of the more costly battles of the Western Theatre. In April of 1862 a large force of General Sherman’s men were overrun by the Confederates, led by Albert Sidney Johnston. As the Union solders lounged around their camp fires, Johnston was able to bring up his men from Corinth, Mississippi for a dawn raid, which took the Union solders by complete surprised. It was said that the charge was so complete that some of the Confederate solders stopped only to help themselves to the hot breakfast the retreating Union solders left behind. While the surprise was all but complete, the Union forces fought hard and were not beaten back, literally, back into the Tennessee River. Late in the afternoon, Johnston was shot and killed, and the command of the Southern forces went to B. G. T. Beauregard, who, either due to illness or lack of nerve, retreated to their beginning position at the end of the day, thus giving back to the ground gained back to the Union army. Meeting with Grant that evening, Sherman was distraught with the day’s drubbing. Calmly Grant said something to the effect, that not to worry, they would get them tomorrow. Grant had brought with him a large number of reinforcements, to bring up his numbers to a greater force than had been there that morning, even counting the subtractions. The next day’s fight was fierce, but the Union forces were able to prevail and the Confederates in the end had to retreat back to Corinth. As with all battles, there were a number of “ifs” that might have changed the course of the battle and in turn maybe the war. Had Johnston not died, he would have most likely continued to push the offensive, effectively pushing Sherman’s men into the Tennessee River, and thus would have won the battle before Grant could come with his additional men. Had Beauregard not been ill and had continued to push as Johnston had, the outcome could have been different. Had Grant not been able to ferry his men to where they were needed, then again, Sherman’s troops would have been left in peril. I am looking for something of the legacy of the battle and to a greater extent the war. It has been such a defining event in the culture of the South, even to those who have little or no connection to the war. 5-21-2013, 5:11pm: This was somewhat a challenging day! Some of the weather system that was giving Oklahoma such a hard time this week is moving towards Memphis. Luckily for Memphis the weather does not include tornados. My plan was to head east anyway, and I thought looking at the local weather, I would be out ahead of the weather. I thought at worst, it would be a deep overcast and it would make photography more problematical. As I wrote this morning, I wanted to include some time at the Shiloh Military Park. It was all good until I left the visitor’s center, and the rain came… a very hard rain. I went ahead and drove around the park and listened to a CD tour, to let me know what was what. But there were no pictures because it was raining so hard. I then took this opportunity to get lunch and by the time that I was done the rain stopped and I was able to get a few photos in. There are a couple that I liked, but mostly, I made images mainly because I would have felt guilty not to. I am hoping to have a better day tomorrow. Speaking of tomorrow, it will be my last day in Memphis. Thursday I will be on the road to Franklin, Tennessee, which is south and a little west of Nashville. I will tell you more then. 5-22-2013-6:44am: I got up this morning an noticed a large black plastic bag that is full of the laundry that I have accumulated durning the past few days. I then looked at the weather reports and thought that it might be better to take the morning off to take care of some personal details. Despite my best attempt to go out each day to make photographs, I still have to take some time to do things like laundry. Weather permitting, I will head out this afternoon and try to find some things to photograph. Tomorrow is moving day, I plan to head east to Franklin Tennessee, which is a little southwest of Nashville. When I lived in Nashville back in the late 1970s, Franklin was a a sleepy little town, but then about that time they build a new Nissan motors plant, which was a boon to the town and the region. The plan is to take most of the day to drive to Franklin, stopping to photograph along the way. I have no plans in Franklin on Thursday, so I will be in no hurry to actually get there. Just so I know what direction to point the car, I will be passing through Jackson, Tennessee, which is really the only city of any size between Memphis and Nashville. Being in Franklin will be a little bit like coming home, as I hope to have dinner with a friend who I went to school with back in the late 1980s. Still there is work to do and that is the reason that I am here. 5-22-2013, 6:56pm: After I did my laundry the weather cleared and so I took off east. I did a different route looking for small communities than I went to yesterday. I tried to hit some of the lesser used roads, hoping to find some more handmade signs.As it turned out the pickings was fairly thin, but I did get a few things that may be worthy. When I got back to the room, I laid down to rest and did not get up for another few hours. I did not realize how tired it was. The day did not turn out to be the most productive, but over all, it still have been a good trip. I am looking forward to the last part of the trip. Part of that is coming to a little different area of the state and I have to say that part of it too, is looking forward to coming home. As much as I love to travel, I also love to come home. Being out for 10 days is turning out to be just enough time away from the home base. 5-23-2013, 5:06am: This morning will be spent getting all my stuff together so that I can check out of my present hotel and move to Franklin, Tennessee. I thought that this was the perfect place to stay. The staff was friendly, the room comfortable, and had easy access to the roads that took me everywhere I wanted to go. I am not sure where I will be staying tonight. There is one place that was recommended, but it is twice as much as the motel that I am staying. I will try to make a decision and a reservation before I leave this morning. I am thinking that I am going to pretty much travel most of the way to Franklin the fastest way possible and then once there, poke around some to see what there is to see. Franklin is located just a little southwest of Nashville. During the Civil War, (1862) Franklin was the location of a clash between Confederate General Hood’s men and those of Union General John Schofield. After at first pushing the Union forces back towards Nashville, Hood tried to fortify his position. After a freezing rain, the Union troops under the command of General George Thomas crushed Hood’s forces sending them into disarray. Hood called for a retreat, his army depleted by wholesale desertion, was a shadow of itself for some time come. In more recent years Franklin brought prosperity, when in the late 1970s the Japanese auto company, Nissan built a plant there. Like with many of the surrounding communities in and around Nashville, there is a nice mix of country living and attitudes, with the availability of what can be found in a bigger city. As I have mentioned before, I use to live in Nashville back in the late 1770s. It was while there I would often drive out in the more rural areas to get to know the area better. I really loved Nashville and it is the only town that I have lived before, (Besides Winter Park, Florida) that I would be happy to move back to. I am looking forward to seeing what has changed as well as what is the same. I would have liked to been able to see some old friends, but there is just not the time. I will have dinner with an old friend, (not that she is all that old) who I went to photography school with. It will be good to see her. While we have kept in touch all those years, there have been few opportunities to actually see her. 5-23-2013, 7:58pm: It turned out not to be the day that I wanted it to be. After some delays in the morning, leaving Memphis, due to a slow down in traffic, for reasons that I am not aware of, I did not get into the Franklin area as soon as I was hoping for, and one I found a hotel, there really was not much of point of going out to photograph today. I am hoping that tomorrow will be a better day. I am disappointed with the ways that things went today, but there is not really anything that I could have done about it. Some would say that I deserved a day off, but when I take a trip to photograph, I feel guilty. On the way in, I did see a little of downtown Franklin, and it was pretty much the way that I remember it from when I lived in Nashville, though it seemed that there were more people out and about. It almost looked like there was some sort of festival event going on. I will check it out tomorrow. 5,24,2013, 3:06pm: I was once asked what was the differences between the different states that I have traveled in the south. This was a difficult question for me as often times the differences are subtle. Often times the differences are tied to the state’s relationship to the Civil War. Feeling can be strong depending on what the state had to go through during the war. I feel that it has less to do with the ideology of the war, but what can be described feelings that can be derived from memories of a more personal nature. Most of the young men who gave their lives for the South did it more for honor, not for slavery or even states rights, but more for it was the thing to do. As a result, there is throughout the intervening history a different connection to what connections a given person has to history. Through my travels in Western Tennessee I have seen different approaches to remembrance of the war. 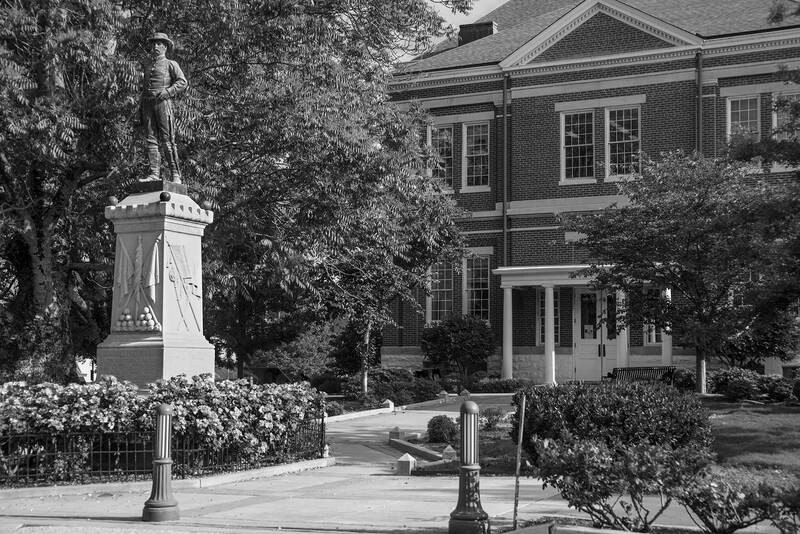 In some cases it was mixed in with tributes to other wars, and sometimes the monuments for the Confederacy was larger than the monuments for any other war that a community sent its sons and daughters to. In Union Tennessee I found it ironic there was a rather large statue of Robert E. Lee on horseback. Tennessee was somewhat torn up about its feeling about the war. The central and northeastern part of the state was mostly union where the west and south sided with the south. In some cases this created problems as the needs of the populace would sometimes be subverted by military needs and would cause some violent results. Tennessee had a pro-confederacy governor and a pro-Union senator, Andrew Johnson. Johnson, who later became Lincoln’s Vice President, played an important role in keeping Tennessee as long as it did in the Union. Even so, feelings ran high and it was not easy, even all these years after the war. 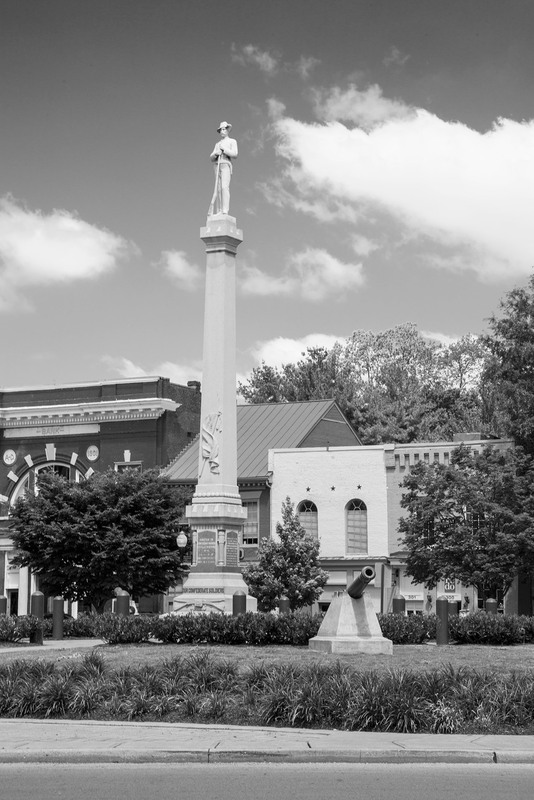 Feelings run deep even all these years later, so it is not uncommon to see Confederate monuments to show their connection to a war that others may find less than a wonderful part of American history. 6-17-2013, Home: I know for some of the readers that this blog kind of cut off a bit too soon and I think that I owe the readers some explanation. Throughout the trip I was somewhat slowed up due to the side effects of some medication that I was taking. While in the beginning it was most manageable, as the trip went on, things got worse. While I was able to have dinner with a good friend on the 24th, the next morning it became obvious that I needed to head home as soon as possible. The long and short of it, I became sick enough that it cost me the next three weeks in the hospital. I am glad to say because of the good work of the Doctors and the very kind and giving care of the nurses, I am doing much better. Thankfully, like Mark Twain, who was to have said in 1897, “The report of my death was an exaggeration.” I apologize for the abrupt end to the blog, but I was in no shape to add anything more. I do hope that you enjoyed traveling along with me as far as it went. While I may not got as many images that I was really hoping for, I think that there are a few gems in there that you might find interesting. In short time I will be adding to my main page blog and I hope that you will continue to follow me there as well. I want to thank United Arts of Central Florida for their support for the trip the blog was created for. Their supports for the arts and artists has been unwavering and deserving of our support in anyway that we can. Best of luck in your shooting trip to Memphis. I know you will have fun and get lots of great images. look forward to seeing through your eyes. I am really excited to blog follow your upcoming trip to Tennessee. I am looking forward, as a current photography student of yours, to “follow” you in your travels and view your photo results in action. Seeing in real view what you have been lecturing about, is both exciting and as I see it will further my photography education. Have a great trip Rick. As I look at the photo of the community theater, I began thinking about the time it was built and finally opened. 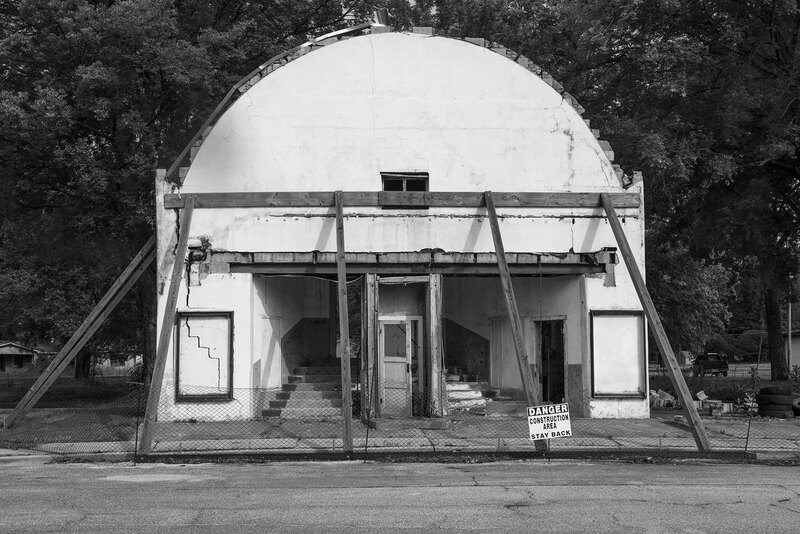 My initial thoughts were that even though the town was not a major city but a rural community, I can see in the theater an attempt at some form of elegance – the curved upward stairways on either side of the ticket booth. The marquees on each side also conjure up images of what was in them opening night. It’s a great photo that provides us a glimpse of the past in rural America. Dyess has a total population of around 400 and for them to pool their resorces to rebuild what I am sure for them is an important local landmark is a good comment on the quality of the community. 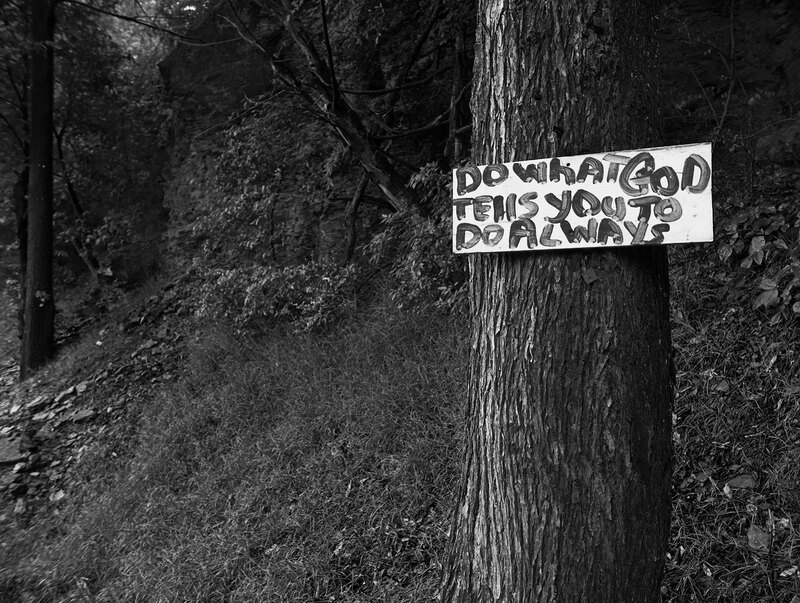 I like the first photo of the trip, the handmade religious sign in Birmingham. I wonder how many others, like you, backed up to to take a closer look. Interesting. I love back road America. Hi Rick, this is the first day I am able to check in with you as I have been working lots. First off Glad you are feeling better, I find your trip interesting as it is a journey that is planned that takes twist and turns. I am enjoying your stories of each place you visit. Your first photo , clear as ever, I love how the tree and beyond is seems so perfect and the sign is written as if a child wrote it. What I find interesting in the the second is the stairs leading into the building. They are stil striking even tho the building is being held up by support beams. I love the photo of the wall with Elvis. The Composition, and almost black and white look. So cool that you caught it before they started to scrape it off. Good luck today and by the way your date is off, it should be the 5th month, you documenting as it is the fourth. Have a great day. Sue Ellen, Thanks for catching my mistake, I have made the change so the dates are now correct. I am glad that you are enjoying my travels, see you a little further down the road! I’m enjoying reading about your travels and seeing your images. didn’t realize you are such a good writer…. I am very pleased to think that I might be an inspiration to you. It can be very special to visually explore something that has such a deep meaning to you. Photography allows you to explore so many things and it allows feel those feelings so much more deeply. A good thing. Have a good trip and I will look forward to seeing the photographs. I am enjoying the photographs and the history lessons. Good luck today Rick, safe travels looking forward to seeing what comes your way. You have given me the itch to get back out and run the back roads. I love the iron work bridge. When I was young I remeber seeing so many steel bridges in rural Ohio. I really miss that. I guess its time to go home and catch some of my own memories before they are gone. You really did a great job catching the light on the back cornor of the Sun sutdios. I enjoy seeing just the simple textures and history of that brick work. The street signs at the Sun StudIo are wonderful. I hope your having a wonderful time. I know I am following your blog. I really liked the perspective you provided on your response to the question concerning the differences you observed between the southern states you have traveled. I am sure many responses would revovle around restaurants, national and state parks, recreation and scenic beauty. You have provided a perspective that I have not thought of since studing the civil war in High School. Your perspective digs below the surface to the very basis of the culture, the civil war, and it’s impact on the South. I believe you have captured that essence not by visiting all the tourist spots but by visiting, photographing and providing us with the authentic culture of the rural south through your daily journal of your travels and the relationship to American History. 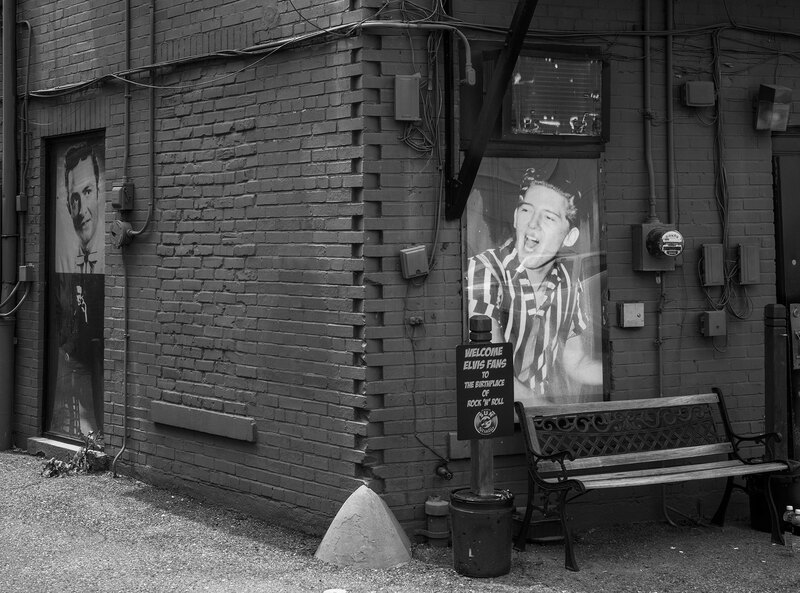 I really like your photo of the back of Sun Records that was part of the culture of the South. You also provided a very unique view of the building. Looks like you’re having a great time. What a great trip. I’m living it vicariously through you and I’m enjoying it with every line and photo…really enjoying black and white. All the best. I am living vicariously through your journaling and amazing photos depicting the rich culture of southern living. The details require significant work – and I am appreciative in allowing your Blog followers to travel with you via the BLOG.